It’s the season of roasts. It really is. Between Thanksgiving, New Years and all the various holidays that fall around Christmas, unless you’re a vegetarian, you’ll probably be partaking in at least one or two roasts over the next mont h or so. 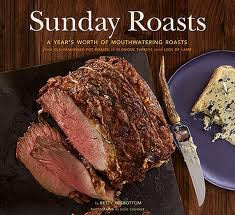 If, along with partaking, you’re also planning on making you might find that Sunday Roasts (Chronicle) by Betty Rosbottom will help boost your repertoire and your confidence. Rosbottom, who is also the author of Sunday Soup, The Big Book of Backyard Cooking and Coffee, breaks Sunday Roasts into several logical sections. Sections on Be ef, Pork, Lamb and Veal, Poultry, Seafood, Sides (as in all the things to be eaten with roasts) and Extras (as in all the butters, chutneys and so on that go alongside the sides) make it simple to narrow down the type of roasting you want to do and find a terrific recipe with which to do it. And though the word “roast” conjures up the idea of a turkey or maybe a big ol’ slab of beef, while Rosbottom includes recipes for several variations of both of those things, there is so much more here, as well. Some favorites: Racks of Lamb with Whipped Goat Cheese and Roasted Cherry Tomatoes; Roasted Cod with Tomatoes and Chunky Guacamole Salsa; Turkey Breast with Cremini, Porcini, and Pancetta Stuffing; Ham Roasted with White Wine, Shallots, and Carrots. In all cases, Rosbottom’s instructions are thorough and precise, including number of servings and estimate of cost in terms of “inexpensive,” “moderate” or “splurge” with far and away the most entries being in the “moderate” category. thanks for that lovely review of my new cookbook, Sunday Roasts! The recipes you listed are some of my very favorites!